Tim Tebow Making The Eagles Roster? There’s an old saying in sports. The team’s most popular player is the back-up quarterback. Nowhere is that more true than in the NFL, where every struggling team has to fend off calls to put in the backup, no matter who that backup might be or how good he may or may not be. Throw two interceptions? They’re screaming for the guy with the clipboard and headset on the sidelines. Eagles coach Chip Kelly better hope he’s immune to that sort of noise, because he’s going to be hearing it a lot. The Philadelphia Eagles have traded Matt Barkley to the Arizona Cardinals, all but confirming that Tim Tebow is going to make the team. Tebow, as you might know, is the most famous quarterback in professional football, despite not being a great pocket passer. Indeed, he’s an infamous backup, having been a backup for the Denver Broncos before taking over as the starter and leading the team to the playoffs. After that, he wasted some time with the New York Jets and spent time in the New England Patriots training camp before coming back out of the broadcast booth to give it a go with the Eagles. 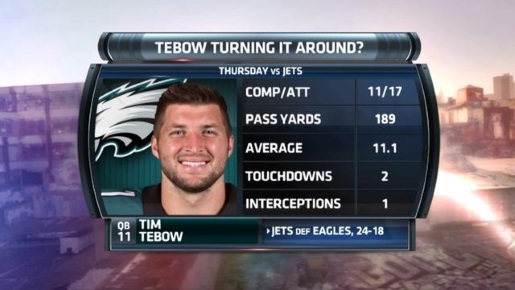 Tebow’s spent a lot of time working on his passing and keeping in great shape, so it’s nice to see that pay off for a person who is by all accounts a good person and who will sell a ton of jerseys. That’s making the assumption that Chip Kelly is going to keep three quarterbacks, and he’d be crazy not to considering just how brittle Sam Bradford is and how bad Mark Sanchez was in his time with the Jets.